Authenticity over authority, consumer power over journalism qualifications and the importance of being there – three themes which were revisited again and again by speakers at the first ever Mojocon – mobile journalism conference – which was held in Dublin in March 2015. Rather than this being an academic conference, at which theories, papers and research was presented, this was an industry event which explored the realities of mobile journalism in newsrooms across Europe, the USA and even further afield. But while there were representatives from countries as diverse as Norway, India and Australia and from news units including newspapers, television and digital start-ups, the themes which returned again and again were the same. The industry across the globe has been united by the same change caused by the same factors – technology development and availability, advertising revenue cuts, global economic downturn and dilution of impact due to myriad news providing options. No longer do journalists find themselves in a hallowed position, choosing and creating the news. Like it or not, as so eloquently phrased by keynote speaker Richard Sambrook of Cardiff University, ‘the consumer is firmly in charge”. And to be honest, the word ‘consumer’ was probably only used in that phrase due to a lack of suitable noun to describe the role now taken by that person – they are news gatherers, documenters, historians, sharers, seekers and consumers. They have the same technology needed to capture and upload breaking news as the journalist, and, being in the right place at the right time, they have the authenticity which whets appetites. Like it or not, journalists are finding themselves moving from being the news providers to being news curators by choosing and honing information provided by a much more authoritative audience. Michael Rosenblum hit the nail on the head when he said: “We make it you watch it is an old model,” adding: “Everybody participates”. None of this is news to people who have been keeping tabs on journalism in recent years. 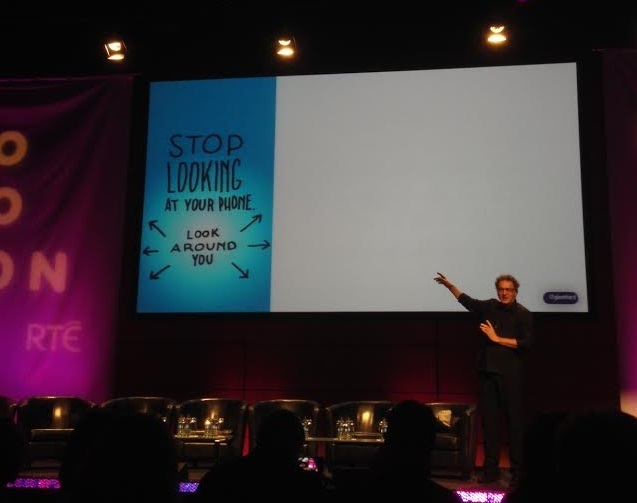 But what was interesting about Mojocon was the impact and effect of this change – rather than pining for the past, delegates at Mojocon were looking to the future, sharing ideas and, it has to be said, salivating over shiny new apps, technology and toys. Long has this change been a painful process, a difficulty in acceptance, a denial and a doomful prophecy of an industry in crisis. But Mojocon showed the light at the end of the tunnel – at least for this particularly difficult stretch of the journey – with practitioners innovating and sharing and showing how brilliant things can be done with just an iPhone and a couple of handy apps. Perhaps the presentation which best illustrated the path of change and things to come was that by Shadi Rahimi, a producer for Al Jazeera network AJ+. Her work documenting the Ferguson riots was not polished, it was raw, emotive, fast, immediate and utterly captivating. No voiceover telling the viewer the news and delivering edited sections to back up that choice, but instead voices of the event telling the story and carrying the viewer with them. It was obvious it had been filmed on a phone and similarly it was obvious why it had been filmed that way; no video camera crew would have had such intimate access to the action. This was the kind of footage which would captivate the longed-for youth which has so long been the target of news outlets across the world – it wasn’t dictatorial, it was truth. What was missing from Mojocon was perhaps the evidence of curation of consumer material – while it was talked about significantly, the demonstrations of it happening were less present – perhaps at the next Mojocon we will see more of this in action. Next Putting the prize chicken into the paywall basket – is the Northern Echo’s move going to pave the way or fall foul?